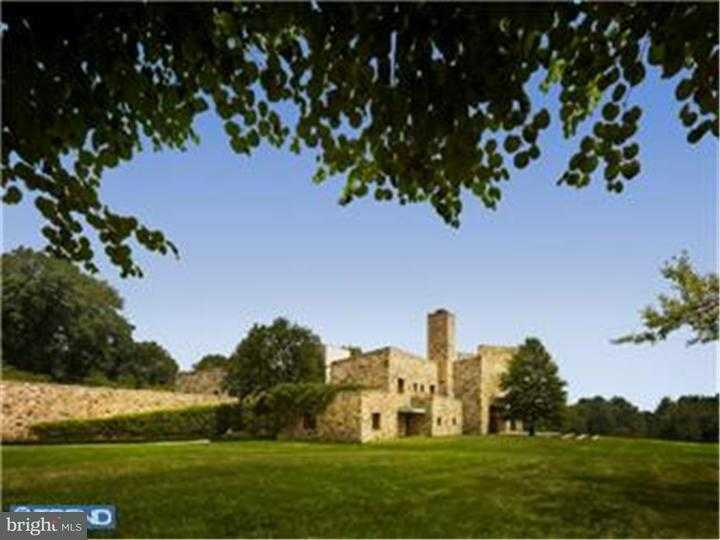 One of the most prominent estates in the Philadelphia region and only 22 miles from downtown, this 37,000 SF modern residence designed by legendary architect Rafael Vi~oly is set on approximately 70 dramatic acres. While brilliant to display grand art collections,and host grand scale events; it is also perfect for an intimate lifestyle. Maximized views of the superb grounds and striking courtyard through lavish floor-to-ceiling windows. A grand 2-story entrance hall, a living room with an approx. 30-foot ceiling. Two dining rooms,library, Gourmet Eat-in-Kitchen, pantry and family room, media room, play room and offices round out the main living spaces. Master enjoys his and her marble baths, dressing rooms, sitting room, office and a private tower retreat that commands 360-degree views of the estate. 15′ & 30′ ceiling heights in certain rooms. Guest rooms open out to private balconies. Amenities include, 20,000 SF Playhouse; indoor,outdoor tennis;4,000 bottle wine cellar; pool, pool house;two stone farm houses,3 bedroom apartment and pond. I would like to schedule a private showing for this property: MLS# 1000270771 – $22,000,000 – 7111 Sheaff Lane, Fort Washington, PA 19034.